Today I am writing about an idea that has been cooking in my mind and heart for a long time, more then a decade I think. For many years I have been refining my curriculum and teaching methods for college-bound students. Now is the time for a fresh challenge. I am preparing to bring my skills and knowledge to Africa through a new project I call, The Thread for Zambia-Connecting Design and Industry for Communities. This is a project about giving people a skill and industry that they can use to support themselves and their children. I am going with a team to Zambia to work with the poor and widows in the city of Lusaka. 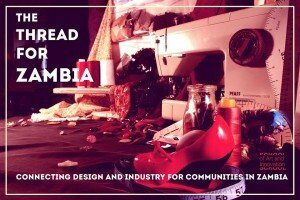 I will be teaching them how to design product, make patterns, sew and manufacture production. I will be visiting women’s prison and teaching them how to sew and build with their hands things that could be useful and helpful for their everyday lives. There is also a possibility to visit an orphanage, and I would like to give those children an opportunity to create with me and then leave them supplies so they can continue creating art. The first priority is to build a mini-factory with sewing machines and materials for the people to use as they design and manufacture their products. I plan on setting up the shop with 3-4 sewing machines and 1-2 servers, 200 yards of fabric and all the essential such as scissors, thread, pattern paper, rulers, pins, needles, interlinings, irons etc. To set up the shop I have calculated that the entire budget will be $3000- $3200, depending on my resources in Zambia. If you would like to join me in this great project and support the cause to help give the gift of skills and knowledge to a community that will benefit profoundly from your donation, this is a great opportunity, your entire donation will go directly to the creation of this micro-indusrty. I am confident that as a community we can do great work that will build lives and deliver value to those who need help and hope.